There are many wonderful hotels in San Francisco, including some of the best hotels in the world. There are also a variety of San Francisco lodging types, such as luxury, boutique and cheap hotels in San Francisco. This guide includes the top choices of hotels in each of these categories for your San Francisco getaway. If you are planning romantic weekend getaways or girls getaways, you might consider the Bed and Breakfast San Francisco options offered here....a variety of neighborhoods are included. Check out the best rates at San Francisco Hotels . It searches 120+ sites in one click to find the best price. When you click the link for the hotels below you will go to a page which has detailed information on the hotel, photos of the hotel and many times reviews written by travelers. If you enter dates in the search box, the computer will look for the lowest price offered at that hotel along with prices for other hotels in the area. By clicking on the price you will be brought to the company offering the lowest rate and more details on the rate. You may go right to the comparison rates of San Francisco Hotels. Mark Hopkins Hotel San Francisco - Nob Hill, famous "Top of the Mark Skybar"
mbassy Suites South San Francisco - 250 Gateway Boulevard (near airport - (South San Francisco). This is the perfect choice to create a discount family vacation package to San Francisco. Our family has stayed at this hotel several times. It's perfect in that with the suite there is plenty of room for a family, there is a delicious breakfast buffet that you can fill up on, and there is a pool for the kids when you return home from a day of sightseeing in San Francisco. There is a complimentary shuttle from the airport to the hotel. So, you can combine this with a 3 day Muni Passport (includes the BART from the airport to downtown) and your transportation..cable car, too!...is taken care of for your weekend getaway. We rented a car when we stayed here (BART wasn't going to SFO then) and that worked out fine, but parking in the city can be a challenge. Holiday Inn Fisherman's Wharf - 1300 Columbus Avenue, dependable Holiday Inn in a great location. Hilton Hotel San Francisco (3 hotels to choose from) - 2620 Jones Street Fisherman's Wharf, 750 Kearny Street Financial District, 333 O'Farrell St Union Square. Carlton Hotel San Francisco - 1075 Sutter St (5 blocks from Union Square). 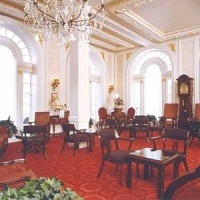 Small hotel, eclectic lobby, complimentary wine afternoons. York Hotel in San Francisco - 940 Sutter Street (near Union Square, theater district). Famous Alfred Hitchcock "Vertigo" stairs. Old syle classic. Beresford Arms Hotel - 701 Post Street (3 blocks from Union Square). Older character-filled hotel, nice-sized rooms, good value. Check out this great selection of budget accommodations in San Francisco including hostels and cheap hotels. Youth Hostel San Francisco Fisherman's Wharf- Fort Mason, Building 240. This is located at Fort Mason in a National Park with beautiful views of the Golden Gate Bridge. It is close to North Beach, a good location. Please know that it is a hostel, which is a different approach to accommodations than a hotel. If you want a San Francisco Hostel at a great rate check out this one. San Remo Hotel- 2237 Mason St. Family-owned small 62 room Victorian style hotel in North Beach. Simple, inexpensive rooms with shared bathrooms. For those of you who enjoy a more personal experience or if you are planning a San Francisco Romantic Vacation.....try a Bed and Breakfast. San Francisco is the perfect place for a B&B because of the many great neighborhoods. You will feel like you are really part of the city and this a great way to meet travelers from around the world. Washington Square Inn Bed and Breakfast North Beach Neighborhood, which is loaded with great restaurants and shops and close to many sights. Washington Square Inn serves a wine and cheese snack in the late afternoon. Simple Breakfast. Smaller rooms are less expensive. 2229 Union Street - 415-346-0424. This 5 room Bed and Breakfast has great hospitality. A wine and Snack in the afternoon and lovely breakfast are served either in the parlor or, weather permitting, in the beautiful garden. Try the intimate "Carriage House", separate from the house, back near the gardens...perfect for a special romantic getaway and includes a jacuzzi tub. 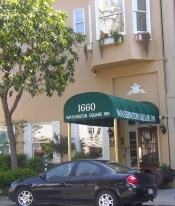 Located in the Cow Hollow area near shops and restaurants of Union Street and Chestnut Street. 775 Bush Street - 415-392-3702 or 1-800-835-1118. This 25 room small hotel has great character and is in an great location, near Union Square and the trolleys. The rooms are smaller and some are without a bath, which makes this a very nice affordable option in San Francisco. Breakfast and tea with cookies in the afternoon. 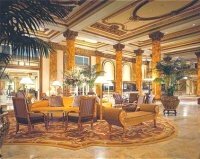 I hope that this guide on hotels in San Francisco will help you put together great San Francisco Vacation Packages. Make sure and check out my pages on detailed information on San Francisco getaways and restaurants.